How Much Money is an Acre of Timber Worth? Just like the first question, my go-to answer as a forester has always been, “It varies considerably.” As an additional qualification for the second question, I would also add one important caveat that universally applies to all property values: Location, location, location. The law of supply and demand drives timber prices and demand is heavily influenced by location, surrounding mill types and the volume and type of timber products that are consumed in a given area. The volume and type of products that are available on a tract of timber will therefore determine the value per acre. Landowners in the US South who manage their land for timber predominately manage for the growth of pine. These pine stands, whether they are regenerated naturally or planted, most often go through even-aged management where the majority of the trees present are the same age (+/- a couple of years). Even-aged plantation pine stands typically experience 1-2 intermediate commercial thinnings (though some may require pre-commercial thinning), and one final commercial harvest, or clearcut. When following this model, thinnings typically remove smaller trees at earlier ages and clearcuts remove the remainder of the larger trees at later ages. The sizes of the trees removed during thinnings and clearcuts are quite different and therefore differ in value. In general, pine logs fall into one of the following categories: trees that are 5”-7” diameter at breast height (DBH) are considered “pulpwood;” logs that are 8”-11” are considered “chip-n-saw;” logs that are 12”+ in diameter are considered “sawtimber.” As logs grow larger, the per-ton value of the trees generally increases. Log quality can impact this, however. Lower-quality trees may be used in a less-expensive product class even though they reached the necessary DBH, so they command a lower price as a result. As I noted in the first blog post, a number of factors determine timber stand volume and quality and, ultimately, the price of the trees on a stand: forest type, soil quality, management regimes, silvicultural applications and harvest type. These factors combine to affect forest growth rates and individual tree quality, which also contribute to a landowner’s decision to either thin or clearcut a stand of timber. For example, younger stands that contain high-quality timber may be clearcut if the trees reach a certain quality earlier in their growth cycle, making the value of the younger timber equal to, or higher than, potential future values of older timber. 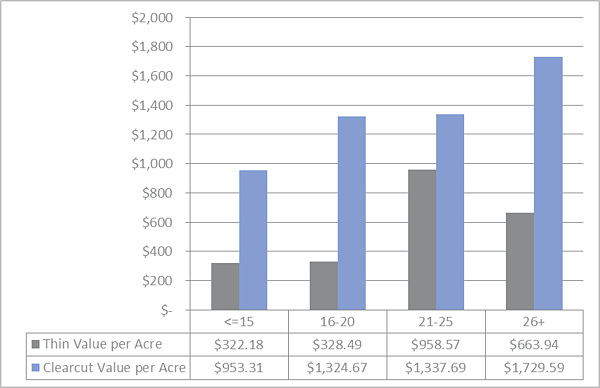 For this blog post, I analyzed US Southwide prices for plantation pine on a per-acre basis by harvest type (thinning vs. clearcut) and age class (<=15 years old, 16-20 years old, 21-25 years old and 26+ years old). I also analyzed US Southwide prices for natural pine by harvest type (concise age class data is unavailable for these harvests). First thinnings of timber between the ages of 15-20 bring lower prices due to the smaller trees that are removed; only pulpwood and smaller logs that fall into the chip-n-saw category are harvested at this time. However, second thinnings in the 21-25 age class typically remove more than just pulpwood, including larger chip-n-saw logs and smaller-diameter sawtimber. 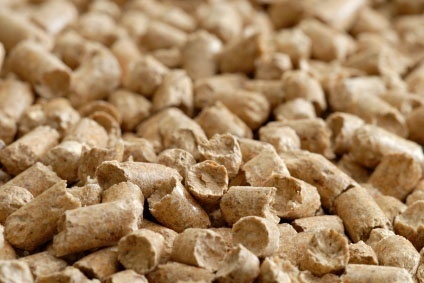 Both products command a higher price per ton than pulpwood, which raises the price per acre. Thinnings in stands that are 26+ years old are less common and oftentimes result in removing less volume per acre, which causes a decrease in the price per acre. Clearcuts, on the other hand, typically carry a higher price per acre due to the average size of the trees that are removed. Most landowners prefer to clearcut their timberland when it is in the 26+ age class, since a majority of the trees have reached the higher-value sawtimber category. However, it is important to bear in mind that a clearcut will remove all of the standing timber on a tract of land, which, even in the case of a managed forest in the 26+ age class, will include both pulpwood and chip-n-saw logs. This mixture of harvested timber products will ultimately affect the price per acre. Naturally-regenerated stands of pine timber often have a higher density of trees than do plantations. During thinnings on natural stands, more material is therefore typically removed, resulting in an increase in volume and price per acre. 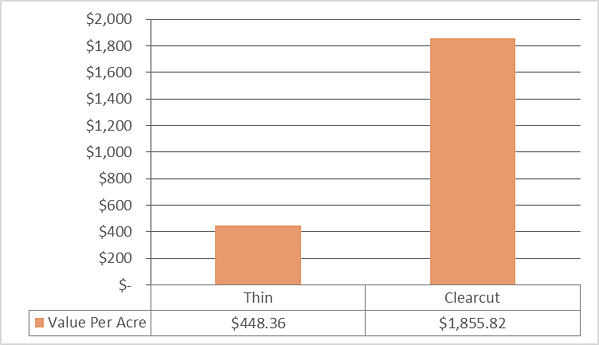 The clearcut price per acre on natural pine stands is slightly higher due to the presence of some hardwood sawtimber that is harvested along with the pine during a clearcut, which carries a higher price than pine in the current market. Older timber stands also typically allow for larger trees, which can affect the total stand volume or the price per tree. The increased timber volumes combined with a mix of hardwood sawtimber will result in a higher price per acre. As I also noted in the first installment, a trained forester is essential to help determine an accurate amount of merchantable wood—and insight into the local market—that exists on an acre of timberland. Prices for timber products can vary considerably even from county to county in a specific region based on demand. To assist landowners, foresters and institutional investors in making sure they get market prices for their timber, Forest2Market’s direct market price data and specific harvest volume information provide the most complete and accurate timber pricing service in the southern US. Our timber price database is continually updated and contains comprehensive sales data from actual timber transactions across the entire region. In 2017 alone, more than 25.4 million tons of timber was added to our database representing an added $425 million in timber sales. In total, our database contains more than 300 million tons of timber valued at more than $6 billion. In the end, the same resources that are required to answer the two most common questions that foresters hear are the two most important resources timberland owners require before selling their timber: a reputable, certified consulting forester who will cruise the timber tract and provide an estimate of timber inventory, and a transaction-based pricing service that provides an accurate view of local market prices by product. Landowners who rely on these resources when selling their timber yield higher returns.